Updated on January 12, 2017: Proper support checks are now part of the article body. Added information about the block value. Minor tweaks and copy edits. Enjoy! If you're a regular reader here at CSS-Tricks, chances are good you know a bit about web fonts. You may even know a few useful tricks to control how fonts load, but have you used the CSS font-display property? The font-display property in CSS is available in Chrome, and emerging in Firefox and Safari (but you might want to check browser support for yourself, since things change all the time). It's a simpler way of achieving what the Font Loading API is capable of, as well as third party scripts such as Bram Stein's Font Face Observer. If all of this is new to you, no sweat. Let's first talk a bit about default font loading behavior in browsers. Browsers are carefully crafted programs, and they do a lot under the hood we may not suspect. Font loading is no exception to this rule. When a browser requests a font asset from a web server, any elements with styles invoking that font is hidden until the font asset has downloaded. This is known as the "Flash of Invisible Text," or FOIT. This behavior is there to "save" us from seeing text initially render in a system font, only to swap to the custom typeface once it has loaded. That behavior is known as the Flash of Unstyled Text, or FOUT. FOIT may sound preferable over FOUT, but FOIT has repercussions for users on slow connections. By default, most browsers will hide text for up to 3 seconds until displaying text in a fallback system typeface while waiting for a font to load. Other browsers like Safari will wait even longer, or perhaps indefinitely, leaving some users in a lurch with invisible text that may fail to render if a font request stalls. These solutions work, but they can be rather unwieldy. That's where the font-display CSS property comes in. auto: The default. Typical browser font loading behavior will take place. This behavior may be FOIT, or FOIT with a relatively long invisibility period. This may change as browser vendors decide on better default behaviors. swap: Fallback text is immediately rendered in the next available system typeface in the font stack until the custom font loads, in which case the new typeface will be swapped in. This is what we want for stuff like body copy, where we want users to be able to read content immediately. block: Like FOIT, but the invisibility period persists indefinitely. Use this value any time blocking rendering of text for a potentially indefinite period of time would be preferable. It's not very often that block would be preferable over any other value. fallback: A compromise between block and swap. There will be a very short period of time (100ms according to Google) that text styled with custom fonts will be invisible. Unstyled text will then appear if the custom font hasn't loaded before the short blocking period has elapsed. Once the font loads, the text is styled appropriately. This is great when FOUT is undesirable, but accessibility is more important. optional: Operates like fallback in that the affected text will initially be invisible for a short period of time, and then transition to a fallback if font assets haven't completed loading. The similarities end there, though. The optional setting gives the browser freedom to decide whether or not a font should even be used, and this behavior hinges on the user's connection speed. On slow connections, you should anticipate custom fonts may possibly not load at all if this setting is used. The font-display property's swap value in action. In this example font stack, the custom font is Open Sans Regular. The system fonts are Helvetica and Arial. When font-display: swap; is used, the initial font displayed is the first system font in the stack. When the custom font has loaded, it will kick in and replace the system font that was initially displayed. Using font-display values of fallback and optional will also rely on system fonts in the stack when necessary. Most of the time you'll use swap. If you don't know which option to use, go with swap. It allows you to use custom fonts and tip your hand to accessibility. If you use fonts that are "nice to have", but could ultimately do without, consider specifying optional. What if font-display isn't supported? You can just use font-display and that's that. If other browsers don't support it, they will behave according to their defaults. This isn't necessarily bad in that it doesn't break anything, but it may not be optimal for you. You can detect support for font-display and provide an alternative. Consider doing this if time and resources allow. Obviously, we'd prefer to use a CSS one-liner like font-display to do all of this stuff for us, but at least we have the ability to fall back to another solution if necessary. As time marches on, font-display (as well as the Font Loading API) may be implemented in most (if not all) browsers. What About Third Party Font Providers? If you embed fonts using a third party service like Google Fonts or TypeKit, there's not much you can do at the moment. Third party services control the content of a @font-face they host, so perhaps consider hosting your own fonts (which I talk about in this article). As time goes on, providers may make font-display a configurable option when you retrieve an embed code from their service. font-display is being actively discussed for potential implementation in Google Fonts, but don't assume every third party service will necessarily scramble to implement it. 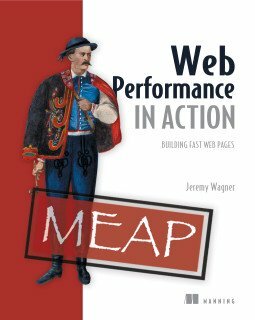 Jeremy Wagner is the author of Web Performance in Action from Manning Publications. Use coupon code sswagner to save 42%! Wouldn’t adding the JS condition to test that this is supported cancel out the benefit of using this? Could you use @supports for the feature detection rather than js? (and fallback for everyone else)? Are there any browsers that support font-display but not @supports though? If anyone has any ideas, I’d love to hear them, because this would be a much simpler way to check for any CSS feature support, let alone font-display. Trying to test with @supports (css) or CSS.supports (js) I’m not getting anywhere closer than you are, with all 3 browsers reporting as false. Very confusing. It can’t work with CSS supports. I suppose that makes sense, interesting. That font-display feature detection may not work. It works in Chrome (when enabled) but it shouldn’t be. It doesn’t work in Firefox (when enabled), as it should be. Indeed, a few years ago, we were working hard to figure out a way around FOUT (flash of unstyled text), which was exactly the situation created by the swap value here. I guess everything old really is new again. Yes, of course, if you are on a fast connection. But if you’re not, it’s better to see unstyled text for a few seconds (or more) than to see nothing at all. With FOUT the transition is „uglier“, but the website is usable sooner. Thanks for the article, I wasn’t aware of this possibility and I already wanted something like this to avoid transparent text. On the problem with external providers, maybe the real answer is—avoid using them? I always prefer to copy the fonts and CSS locally, avoiding any request to an external provider like Google Fonts, so a part of the code is not dependant on an external website able to change it without control. I can definitely understand why some may want to avoid external providers, but those providers have some seriously deep pockets to devote to distributing resources globally for faster delivery. I think any third party provider worth their salt will eventually allow this to be configurable. How did go from “OMG, FOUT = badness!” to it being the desired effect? Accessibility. When browsers block the rendering of text for an unacceptably long amount of time, the possibility of permanently hidden text is an unacceptable outcome for some. Fair enough, it’s just funny the back-and-forth, though for sure. As someone said in another comment, everything old is new again, but this time it’s for a good reason. :) Thanks for reading, man. Thanks for sharing this article, i hope the browsers will provide a support for this soon! Why the browser doesn’t fallback to the next entry on the font-family list? It seems the most obvious way to manage the problem. I load the page, the webfont is still loading, so Asap is still not available, the browser should fallback to Arial, and once the webfont is loaded (available) it should switch to it. If all I’m doing is adding a class to the HTML element, I can achieve the broadest possible coverage by just concatenating the fonts-loaded class (classList has about 90% support in browsers globally). If I need stuff like toggling/removing, I’ll use classList in that case. I fully admit, it’s kind of a persnickety way to do it. What About 3rd Bash Font Companies? So no one has come up with a solution that can fix both FOIT AND FOUT yet?